The foundation day commemorates the founding of the University of Bern in 1834. 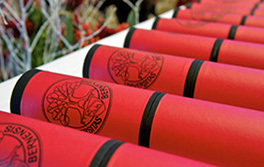 The university's foundation ceremony is held each year on the first Saturday in December. The 184th Dies academicus was held on Saturday, December 1st, 2018. The University of Bern was opened in a ceremony at the Church of the Holy Ghost on 15th November 1834, with speeches being given by new president Wilhelm Snell as well as Professor Ignaz P. V. Troxler and Councillor Charles Neuhaus. The "Intelligenzblatt für die Stadt Bern" wrote of the occasion: "(...) And since precious few of the multitude of listeners gathered there were in a position to take anything away from the speeches, it seemed there was only one cure for the plague of cold feet – music." The foundation of the university, the Dies academicus, has been celebrated every year since. At the Dies academicus, the newly elected president appeared before the crowd of dignitaries, academics and other citizens. He gave an account of the university's achievements and what it hoped to accomplish in the future. He also delivered an academic speech, known as the President's speech. In 1836, then President Karl Brunner said that the foundation ceremony was the most important day of the year, as the heads of the university could finally express their thoughts and reflections to the general public. For many decades, the foundation ceremony began with the President's speech at 11 a.m. in the auditorium. A banquet helped to create a "warm academic atmosphere." As the "Bund" wrote in 1866, "Against the fitting backdrop of the Casino hall, this created a warm academic atmosphere that united the members of the university and their friends in the general public. Even the busts of Homer, Haller, Vogt and other great intellectuals were clad in red and white, casting a sarcastic yet playful eye over the packed hall as though they were trying to say: We may be advanced students of the Elysian Academy now, but don't you worry, young ones: we had our fun once too!" The students occasionally organize a torchlight procession. Meanwhile, the tradition continues to this day of awarding honors and prizes at the foundation ceremony.